These can be eaten as an appetizer, side dish or dairy entrée. Prepare the filling: Bring water and butter to a boil. Lower heat and add the rice. Stir and cover the pot and cook rice until water is absorbed. Cool rice and add the cheeses, salt and eggs. Set aside. Prepare the dough: Mix together oil, water and salt. Gradually add flour until it forms a large ball. Take a small amount of dough and roll into a golf ball size, then gently flatter on a clean surface. 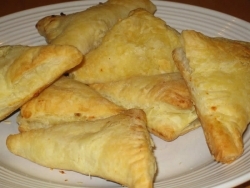 Add small amount of rice and cheese filling to the center and fold over the dough, pinching the edges to close. Press the edges with a fork to give it a nice textured border. Bake at 400 degrees (F) for 15 minutes or until golden brown. hey i think soups,vegetable lunch dishes,chicken rcpeeis type of food is healthy . i love this recipe its delicious try it:its called Stovetop Grilled Cheese Sandwich and heres the recipe this is a all-time favorite can be made on the stovetop. A nonstick skillet is all you need to heat up yummy grilled cheese sandwiches for a quick and easy snack or light lunch. Ingredients2 tablespoons butter, divided2 slices bread2 slices processed American cheeseCooking InstructionsHeat a small skillet to medium high heat. Spread a thin layer of butter on one side of both bread slices; place one slice bread, buttered-side-down, in hot skillet. Immediately place both cheese slices on bread and cover with second bread slice, butter-side-up. When first side is browned, turn over and brown other side. Remove from heat and let cool 2 to 3 minutes before serving.and in others there is my favorite salad try this too if you want to its called:Corn Chip Salad and here is the recipe Ingredients1 pound ground beef1 large head lettuce, chopped1-1/2 cups diced tomatoes1 large onion, diced1-1/2 cups diced sharp Cheddar cheese1/2 cup diced Monterey Jack cheese2 (15 ounce) cans kidney beans, drained8 ounces thousand island salad dressing1 (16 ounce) package corn chipsCooking InstructionsIn a large skillet over medium heat, cook ground beef until evenly browned. Drain fat and set aside to cool.In a large bowl, mix together the ground beef, lettuce, tomatoes, onion, Cheddar cheese, Jack cheese and kidney beans. Cover and chill for at least an hour.Right before serving, add the dressing and corn chips and toss until evenly coated. Corn chips stand in as the crunchy croutons in this taco salad that tosses together ground beef, beans, lettuce, tomatoes and cheese in a thousand island vinaigrette for a colorful crowd pleaser. Was this answer helpful? These came out nicely when I tried them. σημειώνω το "don't let them fool you", από στίχο αγγλικού τραγουδιού στον bestradio.gr. Στα ελληνικά σημαίνει "μην τους αφήνεις να σε κοροϊδεύουν".